David Fifita was praised by head coach Chris Chester after his two-try display. PIC: James Heaton. 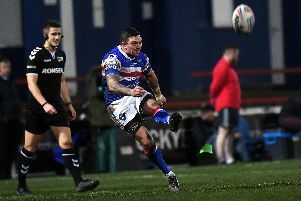 Wakefield came from behind to draw level twice at Belle Vue last night, before a late drop-goal from the ever-reliable Danny Brough secured the two points. Trinity took an early lead but trailed 10-4 at the break. Two tries from David Fifita, either side of a Darnell McIntosh score, then dragged the the home side back on terms on two occasions. Chester's side kept going and finally regained the lead when Brough slotted over the one pointer three minutes from time. "You could've called that one with three minutes to go," said Chester of Brough's match-winning kick. Reece Lyne opened the scoring for Wakefield. PIC: James Heaton. "This team doesn't know when it's beat. We have come from behind twice. "I probably thought a draw was a fair result but I thought we were excellent in the second half. "Our big blokes got us on the front foot. Huddersfield really frustrated us well in that first half and our discipline wasn't what it needed to be. He added: "We certainly know how to come back, there is plenty of fight and plenty of spirit in this team. "And again, we just don't know when we are beat." Chester hailed Fifita's impact in the second half, as the the forward charged through for two tries. The 29-year-old's first try came after he burst the line and side-stepped McIntosh to go over underneath the posts. "It is going to cost us a few more quid," joked Chester of Fifita's double. "He was excellent, his second stint was unbelievable, to score the tries that he did. "I thought Huddersfield did a really good job on him that first 25 minutes. "When we brought him off, he had done something like 26 tackles, so we decided to get him off a little bit earlier. "But he was great. He was the best player on the pitch." 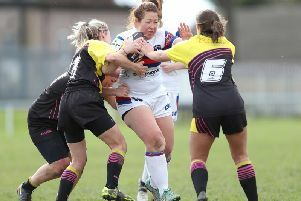 Wakefield stay in fourth spot with five wins from their first nine games. They are six points ahead of bottom-club Leeds Rhinos and four ahead of last season's champions Wigan Warriors. "When you take St Helens and Warrington out of the equation, it is a free-for-all," insisted Chester. "There is a great opportunity for any club [to finish top five]. "And that is why we spoke of how important this run of home games is for us. "If you win the majority of those games, it gives you a hell of a chance to get where you need to be. "And where we need to be is involved in semi-final football, there is a lot of games to go at and and there are lots of things to happen before the semis. "But we are giving ourselves a good chance. If we play like we have the last couple of weeks, with that kind of spirit, then we will win more than we lose."